Get all your essential amino acids in one grain! 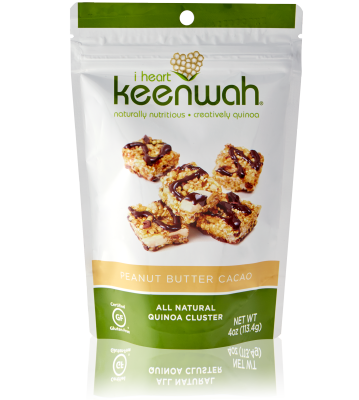 10 lucky Appetite For Health fans will win I Heart Keenwah snacks! What makes a great snack? A combo of carbs and protein with a healthy dose of fat. Carbs will give you energy to keep you going, protein will down the use of your energy and fat keeps you satisfied, prolonging the time until your next meal. You may like to reach for an apple or (hopefully not!) bag of chips. At your next meal, you’ll likely feel ravenous, increasing your chances of overeating. Quinoa is a cool ancient grain that’s high in protein (4 grams of protein for 1/2 cup serving). It’s also got a nutty flavor and when toasted has a great crunch. High in protein, nutty flavor and a crunch–now that’s a making of a delicious balanced snack! We can thank I Heart Keenwah for packaging up this tasty snack! They mix puffed quinoa flakes and whole quinoa with ingredients like almonds or cashews then drizzle in some all-natural sweeteners like honey, tapioca syrup and raw sugar and you have a snack made in heaven. You’ll love all of the flavors I Heart Keenwah is giving away. Entries accepted until midnight EST, Friday, May 2nd 2014. Remember to check back here to see if you won! I enjoy quinoa greatly. I have made quinoa as a side dish with roasted veggies and in a Greek Salad. Tasty and nutritious. Great in chili also side dishes. Instead of using oatmeal, I make quinoa with almond milk and fruit for breakfast! I make black bean veggie patties with quinoa! quinoa cherry chip bars. Deee-licious! I have never tried quinoa, but really want to as I am trying to eat healthier. I mix a quinoa and buckwheat blend into my black bean paste. I can’t tolerate too many beans, lol, so the quinoa blend lightens the digestive impact and tastes yummy too. I never tried quinoa, never even heard of it! but would love to try it! I’m already signed up for your newsletter, and I “Like” both Appetite For Health and I Heart Keenwah on Facebook. I’ve just started eating quinoa, and so far have made savory dishes. I use quinoa to replace rice in certain dishes. I honestly hadn’t thought about trying to use it in something sweet. Guess I’ll have to start coming up with some recipes. These treats would be great to try. I subscribe to the e-newsletter, Like Appetite for Health and I Heart Keenwah on Facebook. I haven’t made any treats with quinoa. To be honest, I haven’t made anything with quinoa. It is something however that I would like to use and figure out how to incorporate it into my diet. Not yet…but I am ready to! Love putting quinoa in various dinner recipes. I haven’t yet but I need to run out and buy a bag of these which look delicious before I try to experiment in the kitchen with my Pinterest hits and misses. I haven’t made any treats but I like to add quinoa to salads. I have made a paella with quinoa but nothing sweet like this. Usually, just eat it as a side dish. Usually, just eat it as a side dish with diced onions and tomatoes and parsley.I would love to try this product. I have tried making quinoa as a breakfast cereal but I prefer my quinoa salad with lots of veggies. I’ve put quinoa in a veggie loaf. I have just recently bought quinoa for the first time, and have only have it cooked in chicken broth. I loved the flavor of it, and would love to try these quinoa snacks. I heard so much of quinoa but never tried it. This snack looks like a good way to start it has chocolate. I like it with spinach and blueberries! I make quinoa and oat granola, quinoa cocoa bars, egg bakes and in place of brown rice in all dishes. It cooks much faster and has a better health profile than rice! I’ve never thought of quinoa as a dessert or snack. I only make it as a side dish with dinner. Who knew? I subscribe to AFH e-newsletter, I like AFH and I like I Heart Keenwah. I usually eat Keenwah with meals…I did experiment out of curiousity and made keenwah toasted coconut and dried cranberries. It’s great in protein cookies! 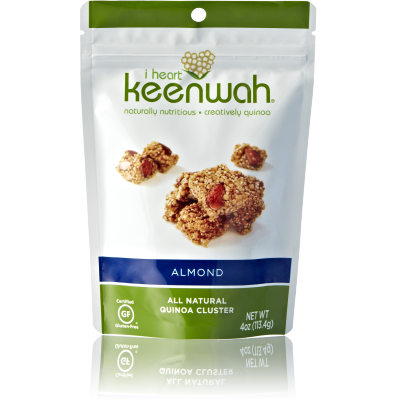 I have not tried Keenwah but would love a different healthy snack! Always ready to try something new that will help with the weight loss. i eat quinoa in salads and just as it is. I’ve also made an awesome gf cake with it. Never snacks thought! very interested! I have not tried it …but I want to! I made some really good veggie burger. I am new to quinoa. Just bought my first bag. I can’t wait to try it and possibly grind up and use as flour since I have just recently went Paleo. Would love to try these snacks so I can switch it up. Just made a fantastic quinoa pudding the other week! Would love to try these snacks, they look amazing. I have had some quinoa in yogurt but that’s about it, never had too much of it but love the protein content. Would love to try these! The winners are: Julie, Meiko, Cheryl F., Mai C., Helen, Eliza, Lisa S., Susan H., Ronda G. and Jason. Please check your email as you’ll be notified if you’ve won the prize! I have never made a snack with quinoa before, but this product sounds great! I use it for everything from a side dish to a salad topper….been a fan of quinoa since the 80’s! I have eaten Quinoa in salads, but haven’t baked with it. I completed other requirements for entry. THanks! I actually haven’t made anything with quinoa, but I’ve heard so many good things about it!